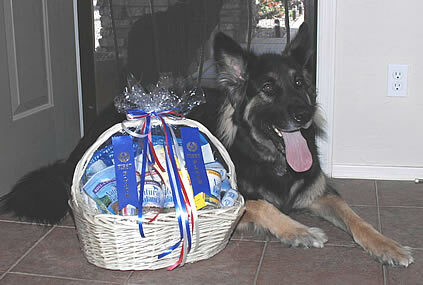 Maximus (FKA “Whiskey”) was the proud winner of two blue ribbons today at the Ahwatukee Dog Show! The show is a fun event open to all dogs, regardless of breed, with prizes in the following categories: best dressed, looks most like owner, cutest, smallest, tallest, best kisser/licker, longest ears, longest tail and best trick. Maximus entered the tallest and longest tail contests. As Max always does he became the center of much attention (he is such a great GSROC mascot) and had quite a cheering section during his two competitions. It was close in the tallest category (they had to measure twice) but Max was 1 1/2″ taller than the 2nd place winner, a Saint Bernard. Max swept away the competition in the longest tail category, winning by 2″ over the 2nd place winner, a Bernese Mountain Dog. In addition to the blue ribbons (which we will proudly display in our home) Maximus won two baskets filled with all sorts of goodies. He brought one home to share with his sisters Aja and Sedona but he “asked” that the other one be donated to one of the rescue organizations at the event. He wished Orange County was closer so he could have donated the basket to GSROC but thought he was still doing good by donating to a rescue in his new home state. As always we are so proud of our Maximus and feel so privileged to have him as one of our furkids.